The Advent season is a special time for the three of us who write on this blog. The most obvious reason being the beautiful story we get to immerse ourselves in year after year of the birth of Jesus and the “great incarnation” of God into this world to complete what Sally Lloyd Jones termed “God’s great rescue plan”. We look forward to this time of the year because of the opportunity to share the Advent of God’s great love with our own kids while also reminding ourselves again and again of the unlikely way Jesus entered our world. Also this time is special because it marks the end of our calendar year of writing through the liturgical calendar from beginning to end. Each week for the last year beginning with Advent 2012 we have written through the Lectionary Year C, working through the all of the major and minor seasons of the calendar. This has brought us great joy to reflect on the weekly readings, drawing the key themes out and tacking them from our own perspective. Like last Advent, we are planing to write through the themes of Hope, Peace, Joy, and Love starting next week. We believe that Jesus is the Christ – the son of the Living God – and that by his Advent into our world he brings all of these things with him. Our world is broken and hurting and we believe that Jesus is the answer to the darkness before us. 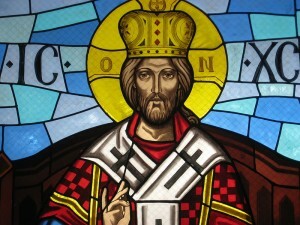 This Sunday marks the feast of “Christ the King” – a time to prepare for the coming of Jesus. Just as the liturgy prepares us for the coming of the King, so will we. This will be our only post this week as we spend time with our families and prepare for the coming season of Advent. Please join us as we prepare for a the new liturgical year. When they came to a place called The Skull,[a] they nailed him to the cross. And the criminals were also crucified—one on his right and one on his left. “What sorrow awaits the leaders of my people—the shepherds of my sheep—for they have destroyed and scattered the very ones they were expected to care for,” says the Lord. Therefore, this is what the Lord, the God of Israel, says to these shepherds: “Instead of caring for my flock and leading them to safety, you have deserted them and driven them to destruction. Now I will pour out judgment on you for the evil you have done to them. But I will gather together the remnant of my flock from the countries where I have driven them. I will bring them back to their own sheepfold, and they will be fruitful and increase in number. Then I will appoint responsible shepherds who will care for them, and they will never be afraid again. Not a single one will be lost or missing. I, the Lord, have spoken! We also pray that you will be strengthened with all his glorious power so you will have all the endurance and patience you need. May you be filled with joy,[a] always thanking the Father. He has enabled you to share in the inheritance that belongs to his people, who live in the light. For he has rescued us from the kingdom of darkness and transferred us into the Kingdom of his dear Son, who purchased our freedom[b] and forgave our sins.